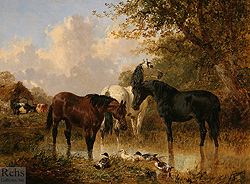 John F. Herring, Jr. was born in Doncaster c.1820, to the well-known 19th century artist John F. Herring, Sr. 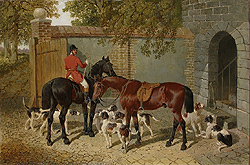 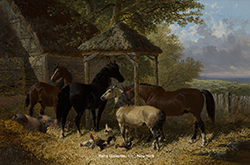 Herring, Sr., at that time, was considered one of England’s greatest Sporting and Equestrian artists and was therefore patronized by the English aristocracy. 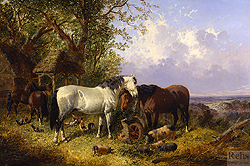 His mastery of the brush and popularity among the nobles served his son, Herring, Jr., well. 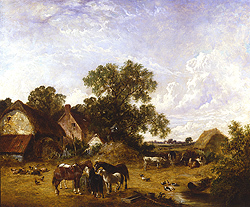 Early on he was exposed to fine painting and wealthy patrons. 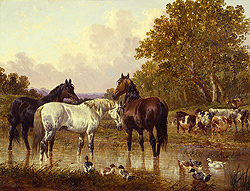 It has been stated in a number of recent reference books that Herring, Sr.’s first child was named John Frederick Herring, Jr. and was born on June 21, 1815 and baptized on October 22, 1815. 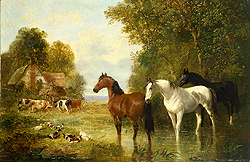 However another child was born in 1820 and also named John Frederick Herring, Jr. (baptized in 1821). 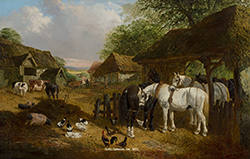 The assumption is that the first Herring child died and the second, born in c.1820, is the artist we know of today. 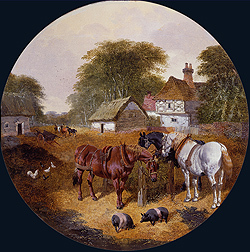 It is no surprise that Herring, Jr. developed a love for painting – a passion that was also shared by his brothers Charles and Benjamin. 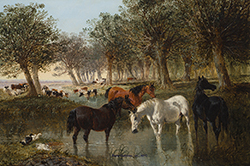 Three of Herring, Sr.’s four sons became artists and painted in the same style as their father – often collaborating on a single painting. 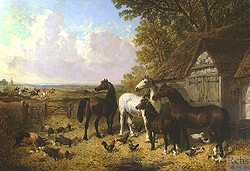 It is obvious, from his choice of subject matter and the style in which he painted, that he received much of his training from his father and in the years after 1836, Herring, Sr., feeling threatened by Herring, Jr.’s abilities and growing popularity began incorporating the ‘SR’ at the end of his signature. 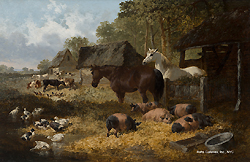 Herring, Jr. continued to paint, in the tradition of his father, sporting and animal pictures, however as his artistic prowess developed his style changed – loosening his brushwork and widening his views. 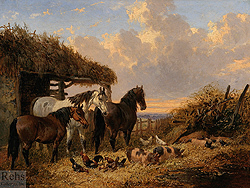 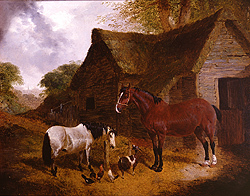 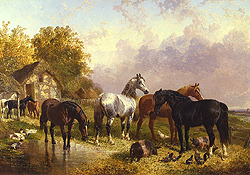 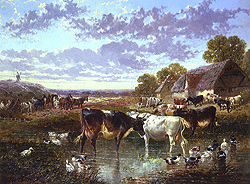 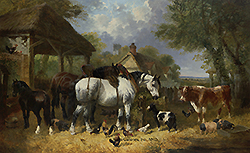 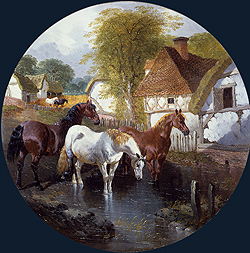 The placements of farm animals at the banks of a stream or in a farmyard were characteristic of his work. 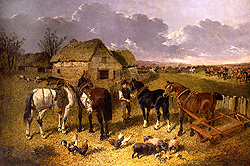 Herring, Jr. married Kate Rolfe, an artist herself and the daughter of Alexander Rolfe, the English angling and sporting artist. 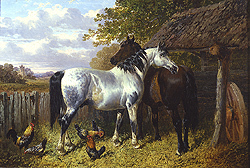 Herring, Jr. would, at times, collaborate with his father-in-law, as well as other artists - painting the animals in their works. 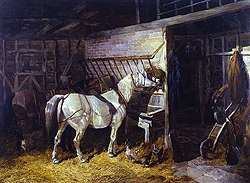 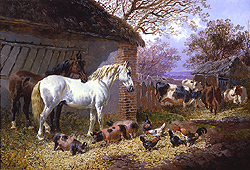 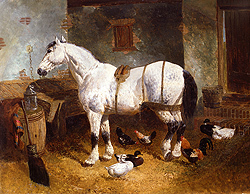 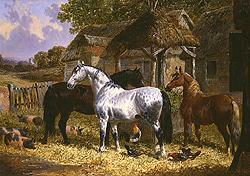 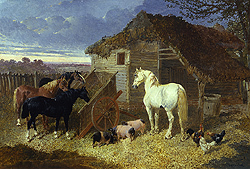 During his lifetime Herring exhibited at all the major exhibition halls including the Royal Academy, where he exhibited: The Farm – Autumn (1863), Farm-yard (1864), The Old Lodge (1865), Watering the Team (1866), The Homestead (1871) and A Farm yard (1873) among others.